Looking for a Texas Vacation? Need Texas information? TouringTexas.com is the largest and most comprehensive tourist guide for Texas. This Texas Tourist Guide has Texas pictures, maps of Texas, Texas lodging, Texas tourist attractions, Texas events, Texas Summer Camps, Texas History, recreation in Texas, Texas Hotels, and much more about Texas. Experience the large variety of wildlife and beautiful scenery in Texas. 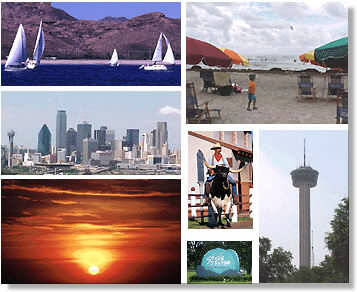 Texas is a very diverse state with 262,017 square miles of territory and 624 miles of shoreline on the Gulf of Mexico. Texas' elevation varies from zero to 8,749 feet elevation. The population is just under 28,000,000 people, but Texas only has an average of 106 people per square mile. Texas has a lot of breathing room compared to New York City, which has a population density of 27,858 people per square mile! The rainfall and climate varies greater with the southeast part of Texas being wetter and the northwest being arid. It is approximately 900 miles from one side of Texas to the other at the widest points. If you are a snowbird from the North which we call Winter Texans, you will absolutely love Texas. Come on down and spend a while in our nice, mild winter climate in Texas. You can play golf year-round in central and south Texas. If you are looking for a place to retire, you will definitely want to look at Texas. Experience the large variety of wildlife and beautiful lakes and scenery in Texas. The prices in Texas are reasonable. The people in Texas are friendly. You have heard of Southern Hospitality? You will be treated well in Texas. You will feel very welcome in Texas. Have you ever considering buying or renting a timeshare resale in Texas? Galveston timeshares are well-equipped and larger than hotel rooms. San Antonio timeshares are another good choice. Timeshare resales online are up to 50% off. HARTH is a Texas non-profit located in Burnet, just NW of Austin on the shores of Lake Buchanan. They specialize in therapeutic riding. Looking to purchase or sell a home? Visit our friends at VIP Real Estate for all your real estate needs. Do you know about a Web Site that belongs on Touring Texas? Let us know about it. Thank you!